Mark Twain was an American author and humorist whose real name was Samuel Langhorne Clemens. He grew up along the Mississippi River in Hannibal, Missouri. His pen name of Mark Twain is said to have come from his time working on the river boats. The term “Mark Twain” was called out by the rivermen when marking two fathoms on the sounding line while measuring the water's depth. Mark Twain is probably best known for his novels Tom Sawyer and Adventures of Huckleberry Finn. 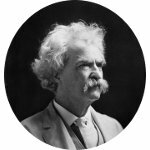 One of the more fascinating facts regarding Mark Twain was his connection to Haley's comet which comes around about every 75 years. He was born in 1835, just two weeks after the comet reached its perihelion. In 1909, knowing that the comet was scheduled to return the following year, he is said to have commented, “I came in with Haley's comet in 1835. It is coming again next year , and I expect to go out with it.” Mark Twain died on April 21, 1910, just one day after the comet reached its perihelion. Mark Twain currently has only a few known famous kin. These include U.S. President Gerald Ford, Currier & Ives lithographer Nathaniel Currier, and the infamous serial killer Dr. H. H. Holmes. He was the main subject of the book Devil in the White City. Dr. Holmes confessed to murdering at least 27 people, and possibly many more, in his hotel in Chicago during the 1893 World's Columbian Exposition.